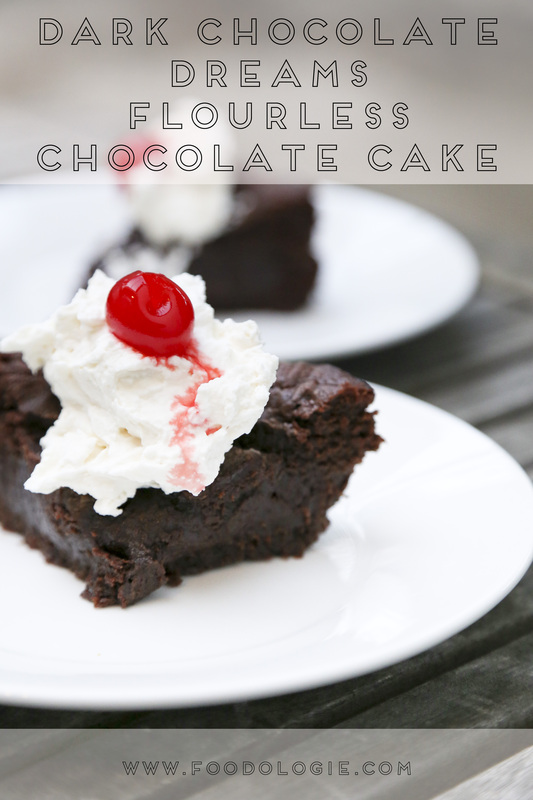 Dark Chocolate Dreams Flourless Chocolate Cake + A Giveaway! I love peanut butter. We all know this. I eat it by the spoonful. It’s a problem I’m working on. Last year, Allison and I threw a Peanut Butter Throwdown (aka an awesome party where we made crazy peanut butter sandwiches sponsored by Peanut Butter & Co.). So to say I’m a fan of Peanut Butter & Co. is kind of an understatement. A few weeks ago, they sent me and a few bloggers their new 31 Days of Dark Chocolate Dream cookbook, full of recipes featuring Dark Chocolate Dreams. So after having the cookbook for a few weeks, eating spoonfuls of Dark Chocolate Dreams and mulling over which recipe to make, I finally decided on the flourless chocolate cake. Valentine’s Day is right around the corner and this is the perfect treat for you special peanut-butter-loving someone. Pre-heat oven to 350F. Generously spray 10 inch round cake pan with nonstick cooking spray and dust with unsweetened cocoa powder. Make a double boiled by filling a medium-sized saucepan half way with water and placing a large glass bowl on the top of the pan. Bring the water to ta boil and add the butter, peanut butter, and salt to the bowl. Mix until well incorporated and turn off the heat. Add chocolate chips and stir until the chocolate is completely melted. Remove the glass bowl from the double boiler. Use an electric mixer to whisk eggs for 3-5 minutes or until the volume doubles. Fold 1/3 of whipped eggs into the chocolate-peanut butter mixture and gradually add the rest of the eggs until mixture is well combined. Pour mixture into the prepared cake pan and bake for 20-25 minutes, or until the edges of the cake separate from the pan and the center is springy. Cut and serve immediately with vanilla ice cream. So in real life, I halved this recipe and put it in a 6 inch cake pan. I still baked it for 20 minutes, and it turned out perfect. I topped it with whipped cream and a cherry, because cherries make everything a little more special. So if you’re looking to downsize this recipe, that’s a great option! Ok so are you ready to try this now? Peanut Butter and Co. is being super awesome and giving away a 31 Days of Dark Chocolate Dreams Cookbook and a 28oz Jar of Dark Chocolate Dreams to a Foodologie reader! To enter, head over to Facebook and enter the giveaway on my Facebook page click the Giveaway tab at the top. The giveaway is open to US Residents and will end on February 14th at midnight! I think this is the next recipe I’m going to have to make from the book – love the cherry on top too! It’s definitely a winner! Also cherries make everything pop! And I am not sure if my comment ever posted because my internet doesn’t like me ! But I would like to try the white chocolate peanut butter! Oo, that sounds good. I have to admit, I’m (strange and) not actually a chocolate cake person at all, but as soon as you make it dark chocolate and add peanut butter?! Yum. I like peanut butter & co on fb too! My favorite valentine’s day treat is anything with red hots on it! This recipe sounds so delicious – I love how few ingredients it has and yet it looks so decadent! I like brownies with chocolate ganache on Valentines Day topped with a scoop of ice cream and whipped cream! My favorite Valentine’s Day treat is anything red velvet! I just love anything Chocolate and peanut butter!!! Can’t wait to make this for my celiac son. He will love it! Great for someone who has Celiac disease, like me. This looks AMAZING, but I think I gained 20 pounds just reading the recipe!! Liked, followed, tweeted, commenting and followed PB & Co a long time ago. Cannot wait to try this recipe, it looks bananas! Love this PB! Maybe I need to get some of the dark chocolate flavor and try this cake! My fave Valentine’s Day treat are peanut butter hearts. Looks great! Can’t wait to test it out! This looks amazing and with my favorite peanut butter company too! My favorite valentine’s day treat is definitely chocolate with strawberries! This looks delicious 🙂 I will have to try! I would love to win!!! My favorite valentines day treat is cheesecake (I want to try raw vegan cheesecake!!) and chocolate covered strawberries of course hehe 😉 Thanks for the chance to win! I love chocolate covered strawberries and peanut butter blondies on valentines! This looks awesome! Can’t go wrong with chocolate and PB. 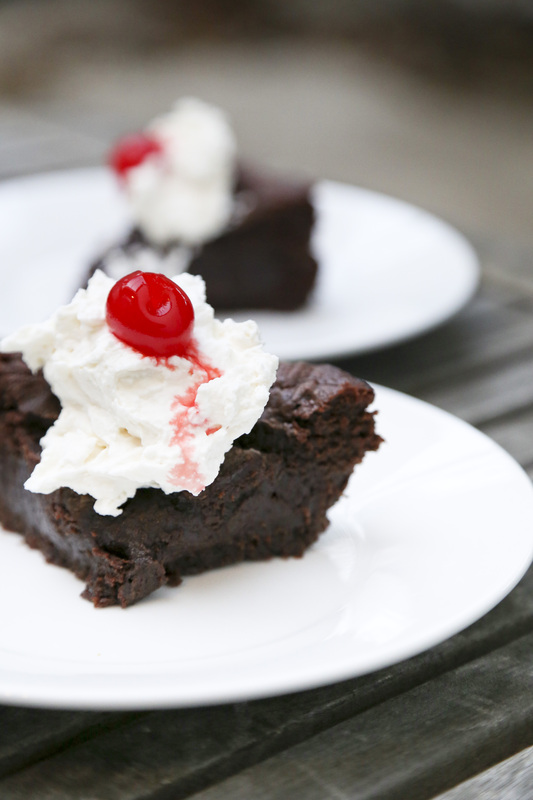 Love chocolate cake with cherries! I am a fan on facebook for the peanut butter..love their chocholate..so good. I love Triple Chocolate Brownies!